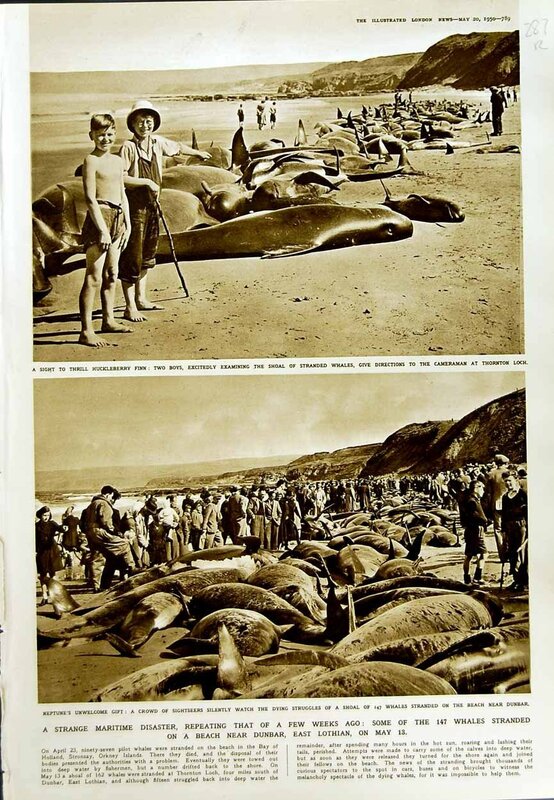 One of the most striking events that I’ve uncovered in my local history research project on Dunbar in 1950 is the beaching and death of 147 whales at Thorntonloch, near Dunbar. The whales were discovered by two local boys who could see a few whales on the beach but many more in the water. There was an attempt to put some of the whale calves out to sea, but they immediately swam back to their parents. The whales attracted huge crowds and it was estimated that around 33,000 people came to the site. This is a remarkable figure, given that very few people in 1950 had cars. The local paper The Haddingtonshire Courier (now the East Lothian Courier) reported that “hundreds of vehicles, including specially chartered buses” arrived at the scene and people had to walk 2 miles in some cases to see the whales. The photo below – from the Illustrated London News of 1950 – shows the whales and the onlookers. As part of my research, I’m going to be interviewing people who went to see the whales. We’ve had a great summer here in Dunbar and we’re now into an Indian summer, a term which has its origins in North America, where the native Americans needed warm and settled weather in September in order to get their crops in. The fine weather has meant that I’ve been able to do quite a lot of cycling. This week’s cycles around the East Lothian countryside have seen me accompanied overhead by huge skeins of pink footed geese, heading for Aberlady Nature Reserve. The extended V shapes in the sky are a great sight and you can hear some of the geese calling out. These calls are to keep the younger geese in line and to prevent them from getting separated from the main group. The countryside itself is changing. The harvest is over and the ploughs are back in the fields, turning the fields from the post-harvest yellow to shiny brown. The poet A E Houseman features ploughs in his poems, including Is my team ploughing? which opens with “Is my team ploughing,/ That I was used to drive/ And hear the harness jingle/ When I was man alive?”/ Ay, the horses trample,/ The harness jingles now;/ No change though you lie under/ The land you used to plough”. Horse ploughing in small fields is no more and today’s satnav enabled tractors with their shiny, flashing blades ease across the fields, leaving a glistening brown wake behind them. Hilary Mantel, the author of the excellent Thomas Cromwell centred novels Wolf Hall and Bring Up the Bodies has a new collection of short stories out, under the arresting title of The Assassination of Margaret Thatcher. The title story was published in full in The Guardian at the weekend and an intriguing read it is. A woman in a flat near a hospital where Mrs Thatcher is being treated answers her door, expecting the plumber and lets the man in as he might be the plumber’s son. The man turns out to be an IRA assassin. I’ll let you read the story yourself via the link, and decide for yourself whether this is up to the high standards set in the two Cromwell novels. This entry was posted on September 24, 2014 at 11:36 pm and is filed under cycling birds reading poetry new books, Dunbar, history. You can follow any responses to this entry through the RSS 2.0 feed. You can leave a response, or trackback from your own site. I just like thhe helpful info yoou suppoy for your articles. I’ll bookmark your bllog and take a look at agan right here regularly. here! Bestt of luck for the next!